Here are 5 of the best TV deals on Paytm Mall right now. If you’re thinking of purchasing a new TV for your home then you’ve come to the right place. Today, we have handpicked the best deals Paytm Mall has on TVs from brands like Sony, LG, and more. The platform is offering up to Rs 20,000 cashback. The Sony 43-inch Full HD Smart LED TV offers a resolution of 1920 x 1080 pixels. The TV features built-in Wi-Fi that allows you to connect the TV to your home network and access apps like Netflix, Youtube and more. The TV has two HDMI ports and two USB ports to connect multiple devices. View deal here. The Samsung UHD LED Smart TV offers a resolution of 3840 x 2160 pixels with a panel size of 55-inches. The TV comes with built-in Wi-Fi, which allows you to watch content from streaming apps like Netflix, Youtube and more. The TV comes with multiple HDMI and USB ports to connect external devices. View deal here. The LG 32-inch KD Ready Smart LED TV features a built-in Wi-Fi that lets you download and access apps like Netflix, Youtube and more. View deal here. The VU 43-inch Full HD Smart LED TV offers a resolution of 1920 x 1080 pixels with a panel size of 43-inches. Users can also download and watch content from apps like Netflix, Youtube and more. View deal here. The Panasonic 32-inch LED TV features an IPS LED panel that offers a resolution of 1366 x 768 pixels. The TV comes with multiple HDMI and USB ports to connect external devices. View deal here. 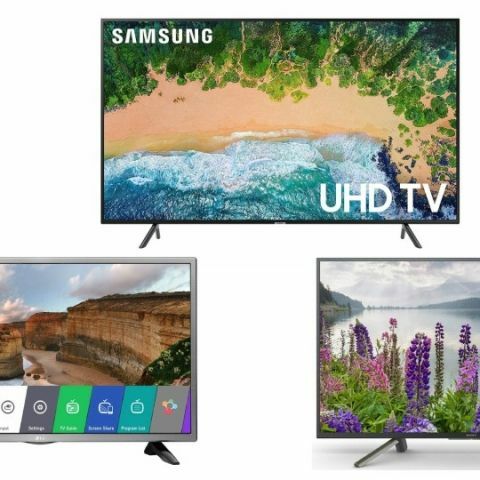 Which 32\" smart LED TV is best: Samsung 32H5500, Sony Bravia KDL-32W670A and 32W700b or LG 32LB5820?